Get some rest and unwind at an exquisite hotel or Agrotourism getaway. When it’s snowing outside, the warmth of fireplaces and snuggling up is a thoroughly enjoyable experience. There are many hotels in the Troodos area, and most are within close proximity to the ski resort. If you’re not planning on skiing, you can always head somewhere a little further afield to enjoy the winter ambience. From Kalopanayiotis to Pedoulas, Kakopetria to Platres, there is an endless list of places to put your feet up for the night. What about Spring!!! Cyprus in springtime is lusciously GREEN! Spring in Cyprus is, for most people, the best time to visit. Winter’s rains bring the countryside to life. February and March are the prime months of verdant colours to behold. The main months of rainfall are December, January and February and, after the countryside has been inundated with much needed water, the magic and the beauty begin to blossom. It is a wonder how plants can withstand such intense fluctuations in temperature yet still survive. 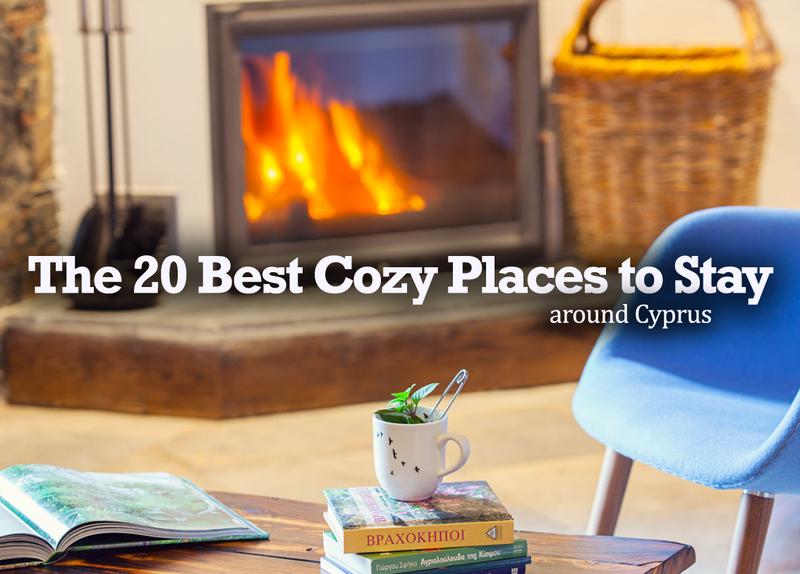 Some of the Cosiest Places to Stay around Cyprus are in the Villages of Kalopanayiotis, Pedoulas, Kakopetria, Askas (Nicosia District) Pano Lefkara, Vavla, Kato Drys (Larnaca District) Platres, Lofou, Omodos, Arsos, Potamitissa (Limassol District) Episkopi and Droushia (Paphos District). "Aristotelio" is a small and remarkably elegant hotel, ready to offer a warm hospitality. Located in the community of Pedoulas, in the highest valley of Marathasa, at the tops of the Troodos Mountains. The community is surrounded by pine forests and the views from the rooms are stunning. It currently has 8 beautifully decorated rooms, a restaurant and a bar. The elements of wood, the local stone and the attended decoration reveal the glamour and the elegance of the old mansion, offering comfortable and luxurious accommodation. The rooms are spacious with their own fireplace and a balcony overlooking the green surroundings and the blue clear sky. The whole decoration is a wonderful mix of antique and modern elegance. A particular supremacy in the rooms constitutes a comfortable bed with high quality mattress for restful sleep. Discover village life in Cyprus through a luxury hotel and spa set in an ancient mountain range. A welcoming, traditional village, cascading down the mountainside, inviting guests to experience a tangible past now revived in a proud, Cypriot community. The ancient spa village of Kalopanayiotis has for centuries attracted pilgrims, but in more recent history was a community built around agriculture, the land and cottage industries. However, the 20th century experienced a drain as people left their villages to find work in cities and abroad. Now with 43 guest rooms in 8 houses across the village as well as cafés and restaurants, villagers have been inspired to invest in their own community, restoring their homes and opening small businesses, preserving our mountain culture and way of life. APOKRYFO comes from the greek ‘"hidden away.....kept secret" a fitting name for this secluded property. Apokryfo is a unique hideaway located at the edge of the picturesque village of Lofou, in the foothills of Mount Olympus, Cyprus. This boutique hotel is made up of a cluster of old stone houses that have been painstakingly renovated by the owners: local architect Vakis Hadjikyriacou and his interior designer wife, Diana. Oinoessa is a complex of two luxurious stone-built houses, consisted of six deluxe studio apartments that surround a private courtyard. It is located in one of the most scenic and unspoilt areas of Cyprus, the picturesque village of Lofou. Here, you will find peace and tranquillity: it is the perfect getaway from the stresses of modern life. Situated in Lefkara village, RedBlueDoor offers fully equipped stone houses, which combine both traditional and modern features. Free WiFi is available throughout, while some villas also enjoy spa facilities. The traditional houses at RedBlueDoor are decorated in bright colours and feature stylish furnishings. They are air conditioned and include a well-equipped kitchen with dining area. The spacious living room features comfortable sofas, traditional rugs and a satellite TV. Some houses offer a private swimming pool with a lovely furnished terrace. They also include a wellness room with hot tub and steam bath. The surrounding area of RedBlueDoor is ideal for outdoor activities, such as fishing, hiking and cycling. The town of Larnaca is 35 km away from the complex. Free private parking is available nearby. Linos Inn is situated in Old Kakopetria village, in the Solea Valley - approximately 50 km from Lefkosia (Nicosia) the capital of Cyprus, 50 km from Lemessos (Limassol) the 2nd largest town and 15 km from Mount Olympus, the highest peak of the Troodos mountains. Linos Inn is in fact a complex of old houses that has been restored and transformed under the regulations of the Cyprus Tourism Organisation within the framework of Agrotourism, so as to establish a superb homely environment offering a traditional experience that can be truly enjoyed. The term "linos" refers to the very old place where with very primitive methods, grapes were squeezed for wine making. Because such "linos" were found in these old houses we restored, it was decided to name the inn "Linos Inn". Linos Inn consists of various types of accommodation including studios, double-bed rooms and suites the "Linos Restaurant" offering international and cypriot cuisine, and a Pizza-cafe. All rooms are fully air-conditioned and with old traditional furniture, balcony or veranda, central heating, bath and w/c, telephone, radio, satellite TV, mini bar, fire place and Jacuzzi in most of the rooms. The studios are equipped with refrigerator, double Jacuzzi as well as all the facilities of the other rooms. There is also a sauna and a bar, a small garden and two verandas for exclusive use by our guests. A conference room for approximately 30 persons, air conditioned and equipped with visual aids, a teaching room, a lounge and a wine cellar will shortly be added. Arsorama is the home we inherited from our ancestors and which the government has declared preserved. Due to the many beautiful memories we have had in the years gone, by with our great grand parents, we wanted to honor their memory by bringing back life to our ancestral home. This has long been a dream come true for us and with love and attention to detail, we christened the renovated house Arsorama (Arsos + Orama – Arsos + Dream). Our intention was to provide our visitors with quality, beauty comfort, luxury, friendliness but at the same time close links with tradition. Bearing this in mind, we gave much attention love and care to provide a truly atmosphere agricultural resort in the central square of the village. Arsorama, consists of our holiday home and 4 independent apartments which are all connected by a large internal stone paved garden. Years ago, the garden was a meeting place of many of the ladies of the village where they would chat and embroider together; it could in face be likened to a female kafenio (café) where they could enjoy each others company; our grandmother being much loved by all and always welcoming. Hosted in a 1930s stone building, this vintage-style hotel offers free Wi-Fi, and on-site fitness facilities. It is located in Pano Platres, at the foot of the Troodos Mountains. A 250-year-old pine tree growing through the roof is the centrepiece of the lobby, which also features an ancient brick fireplace. Guests can relax in the TV corner while enjoying a drink from the lounge bar. Certified Cypriot breakfast is served in the morning. The rooms of the New Helvetia Hotel have en suite bathrooms, and are equipped with radio and satellite TV. All rooms have a balcony looking out onto the pine trees. The several outdoor activities of the Troodos Ski Resort can be easily reached by car. Free private parking is available near the New Helvetia. Welcome to the House of Lyhnos, a house whose history goes back two hundred years. Almond blossoms in the spring, picking hazelnuts in August, grapes and vines, grape flavours and wine, ash-coloured olive groves and blessed oil, heavy winters, wet earth, the smell of fireplace and smoked meat, the full flavours of fruits, cold water, the rustle of the river, roofs made of reeds, balconies made of pine, rough cobblestone streets, stone houses, low chapels, Cyprus tulips, French daffodils and thorny brooms, nightingales and swallow nests, all in a place closed, hard and gentle at the same time, a fallow mountain, the daily toil of the people cultivating the earth, soft conversations, modest looks, passion and tenacity, an open sky that changes with the seasons, days rolling simply and unpretentiously, nights lit by stars and oil-lamps ... These are some of the things we truly cherish in Askas village we decided to show and share them with you at the Lyhnos (Oil-lamp). "To Konatzi of Marika and Yiannis" is situated in the centre of the village and it was built in 1865 by the members of the family. The House was restored in 2016 with the help of the family and was given the name "The Konatzi of Marika and Yiannis" which in the Greek Cypriot dialect means "The Grand House of Marika and Yiannis" in order to honour its predecessors. The project falls under the Agrotourism program of the rural funding for tourism businesses for the period 2007-2013 which is co funded by the Republic of Cyprus and the European Regional Development Fund (ERDF). It is considered to be one of the biggest residences in Kato Drys and it can accommodate up to 20 people. It consists of 5 rooms, all self-catered as well as a beautiful inner open patio, a living room and a kitchen as common spaces. KTIMA 1937 Kannides is a traditional house that has been tastefully renovated and converted into a complex of five apartments in Droushia Village, Paphos District. KTIMA 1937 Kannides started its operations on 15th June 2013. The Complex consists of five self catering apartments (four one-bedroom and one two-bedroom). Each apartment has a well equipped kitchen (without oven), sitting room, TV, Wi-Fi internet access, air-conditioning and fire place or woodstove. The original house was built by Spyros Kannides and his wife Marikka Kannides in the late 1920's. It was passed on to one of their sons Savvas Rikkos Kannides (born in 1937) and finally to their grand children. The house had eleven rooms which have been renovated and transformed into five apartments. The property was originally used for family farming, mainly chickens, rabbits and pigeons. The stone built pigeon house has been reconstructed and can be seen on the property today. Welcome to Ambelikos Agrohotel, a little gem situated on the eastern slopes of the Troodos mountains in the village of Potimitissa. With traditional cuisine and local wines and tucked away from the busy tourist areas, Ambelikos is the ideal base from which to visit the mountains and surrounding villages.and experience the rural side of Cyprus - off the beaten track and a haven of peace and tranquility. Whether you visit local wineries, historical churches and monasteries, walk the beautiful nature trails or just simply switch off and reconnect with nature, its close proximity to all sides of the beautiful Troodos mountains and picturesque villages such as Omodos, Pissouri and Kakopetria, means there is something for everyone. In a typical Cyprus Village, Episkopi of Pafos, ideally located for exploring this beautiful and unspoilt region, the traditional Piskopos House can easily become your perfect place of lodging. within the framework of the philosophy of agrotourism, and ecotourism. This restored lodging create a warm atmosphere that will be engraved deep in your memory. At the same time, you will enjoy your holidays in the Cyprus countryside with the comfort of a household that will soon feel like home. From then on await a handful of pleasant surprises nature has in store for you: millions of different scents, images of unparalleled beauty, walks down nature trails, visits to historical monasteries and archaeological sites, the real life of Cyprus. Vavla Rustic Retreat is your ideal destination for a quiet, rustic get-away into the countryside of a village steeped in culture, history and traditions. Situated at the very top of the village of Vavla, the panoramic view of the surrounding valley and mountainsides, accompanied by the peace and tranquility that surrounds you will simply take your breath away! This traditional Cypriot stone house from the 19th century has been restored to its former glory through the Agrotourism subsidy project funded by the Cyprus Government and the European Union. Come and experience the wonder and authenticity of this traditional stone house, the peaceful surroundings, and maybe even a visit to our family's own fruit orchard to pick your own seasonal fruit! All the wonderful compliments and praise that are bestowed on Omodos Village, apply equally to the 'house that Stavros built' Named in honour of his father (Yianni) this superb, upmarket yet traditional complex of ancient house, shop, avant-garde restaurant and superb tourist suites of boutique style accommodation, is at the forefront of 'agro-tourism' in Cyprus. Certainly the European Union and the Cyprus Government think so as they have listed the complex as a protected building. Viewed from the quaint and narrow street fronting the complex, it seems just like any other village house. Inside is a different story. each holiday suite contains a large double bedroom – complete with 4 poster beds and luxurious en-suite facilities, a well appointed sitting room (satellite TV etc), with far reaching views over the surrounding verandah’s and of course the very latest in fully equipped kitchens – extra sleeping facilities are available in the sitting rooms.